This American automaker is bringing back a supercar to compete with the best worldwide. The reports are in, and Ford (NYSE:F) is bringing back its high-end supercar, the Ford GT. But while only a limited group of buyers will get their hands on this vehicle, the rest of us can still admire the car and what it can do for Ford. The Ford GT is well known among car enthusiasts not because it's common, but because it's rare. Produced from 2004 to 2006, just over 4,000 units of the original production Ford GT were made. Original production Ford GT. Source: Wikimedia Commons. A rebirth of this Ford supercar has been a routine presence in the rumor mill, and the fact that the next-generation Ford GT is getting so much attention comes as no surprise to car enthusiasts. Ford based the original Ford GT on the racing cars the company produced in the 1960s, and the latest version retains some of this design language. This can be seen in the shape of the front end as well as in the design of the tail lights. 2017 Ford GT. Source: Ford Motor Company. Clearly, Ford wanted to bring some of the original Ford GT along for the new model, but Ford has made changes. Besides an overall redesign of the body, the new GT gets a twin turbocharged EcoBoost V6 instead of the V8 the last version of the GT carried. While people purchasing a $300,000-plus supercar are unlikely to be concerned about coming up with gas money, using the EcoBoost V6 instead of a V8 helps Ford's eco-credentials and brings more prestige to the EcoBoost series of engines. 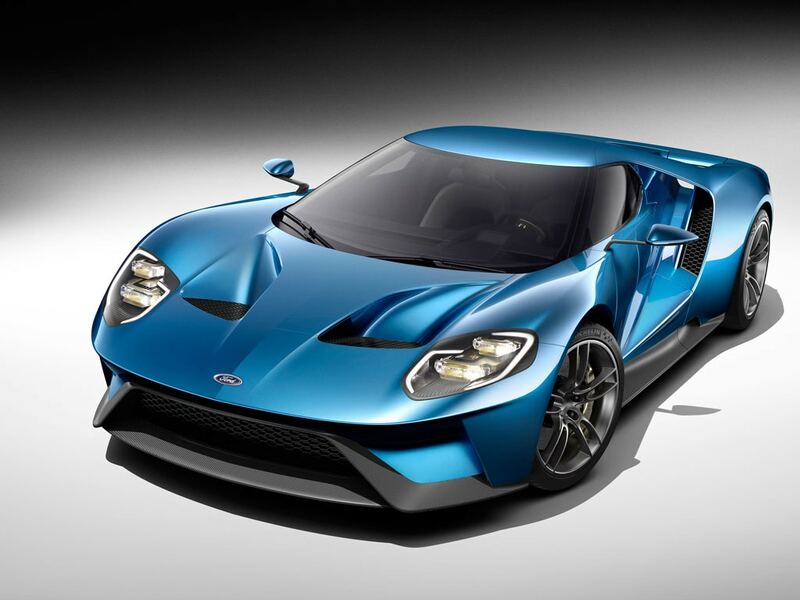 Current reports suggest demand for the Ford GT is strong, and the automaker is working to decide who gets the first produced GTs when it goes into production in the second half of 2016. Ford has already designated this as a limited-production vehicle; and with a six-figure price tag, don't expect GT sales to approach those of the company's popular F-150 pickup trucks. The automaker may even keep production below the level of demand to maintain the prestige of the supercar. This technique has been employed by Fiat Chrysler's Ferrari unit to maintain Ferrari's exclusivity, even as demand for the Italian supercar continues to rise. At this point, Ford has avoided releasing the concrete numbers required to determine the impact of the Ford GT on the bottom line. However, there are some ways to develop general estimates based on the limited data available. 2017 Ford GT (rear view). Source: Ford Motor Company. During the last run of the Ford GT, the automaker produced roughly 2,000 units per year. Since Ford has not released production numbers for the current GT, I will use the 2,000 figure in these calculations. The price of the car is expected to be in the $300,000 to $400,000 range, so we will use $350,000 as an average of the two. Finding margin comparisons is more difficult since Ford's existing models make horrible margin comparisons to a six-figure supercar. Here, I'll use Ferrari's operating margin of roughly 15%. Using these numbers, the Ford GT would bring about $100 million in pre-tax income to Ford. While this may seem like a lot, it would just be a small part of Ford's overall pre-tax profit, which totaled $6.3 billion last year, and the automaker expects it to rise to $8.5 billion to $9.5 billion this year. While the Ford GT should help boost the automaker's bottom line through GT sales, the biggest rewards may come from other sources. By bringing back the Ford GT, the automaker attracts more attention to the Ford brand and could encourage more buyers of less expensive vehicles to choose Ford. More specifically, the Ford GT could bring more attention to the Ford Mustang which will feature a 310 horsepower 2.3 liter EcoBoost engine as an option. Using the EcoBoost engine in the GT could serve as a way for Ford to promote the four cylinder EcoBoost engine in the Mustang; a car that typically attracts those looking for high powered cars. Compared to the GT, the Mustang is a much higher volume vehicle selling over 80,000 units in 2014. With the market for vehicles in the Mustang's price range being far larger than the GT's price range, a sales boost from attention surrounding the GT could make the Mustang the biggest beneficiary of the new Ford supercar. The impact of this would be extremely difficult to separate out of Ford's sales numbers, but never underestimate the power of a brand to sell vehicles. After car enthusiasts have discussed it for so long, Ford is finally bringing back the Ford GT with a starting price in the six figure range. If Ford can sell the new GT in similar quantities as the last version, while earning Ferrari-like operating margins, the supercar should provide a small boost to the bottom line.